TET. Frontside Ollie out of the extension. Jenkinson Street Mini ramp. 1990-ish? I'm not a skateboard collector but I do have a 'Grail' deck. A favorite skateboard that I once owned and have fond memories of riding. A skateboard from the 1980's and 90's that is, these days, generally referred to as an 'old school' deck. My Grail is a 1990, Jim Thiebaud, Santa Monica Airlines, Red Wood Stain, Sanity, Giraffe deck with Red, Powell-Peralta, T-Bone Wheels. 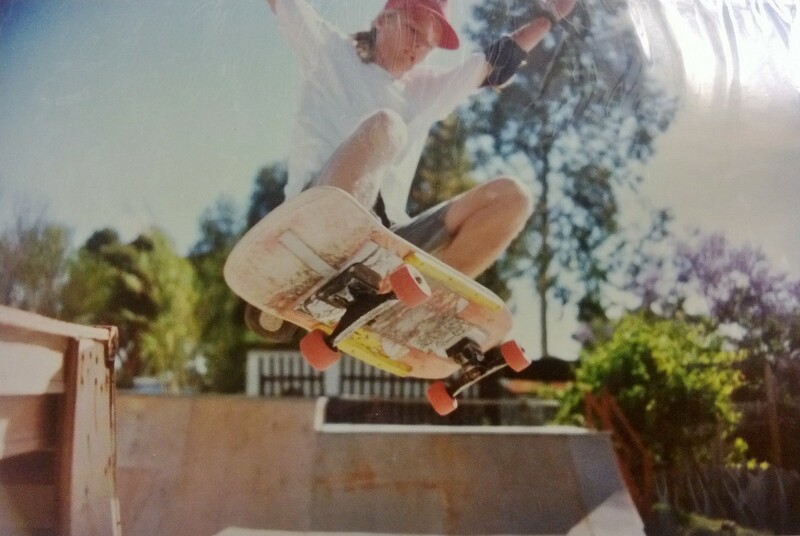 That's the deck I'm riding in the photo above, on the backyard mini I designed and built, back in 1990. Skateboard collecting has become a thing. Generally more popular with skateboarders, who actually were skating through the 1980's and 1990's, seeing the transition from fairly flat, 'fish tail' style decks, through to the modern standard, Popsicle decks that phased out nearly every other deck shape in their wake. From my point of view, the noughties resurgence of Penny boards with millennials (which are based on the 1970's fore runners to the bigger and wider boards of the 1980's) seemed to inspire a renewed interest in the shapes and pro-models of the 80's and 90's. This period is arguably skateboarding's time of most rapid growth and innovation in every aspect from board, truck, and wheel design to tricks, ramp design, and the merging of freestyle into street and ramp skating. Not to mention skateboarding's influence on other sports like BMX, Snowboarding, Scooters, and even its own origin sport, surfing. Some of the sports biggest stars shone brightest throughout the 80's and 90's with pro-model decks being more of a thing than they seem to be today. (Though that could be just because I'm out of touch with today's stars). 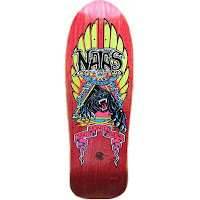 Back in the day you didn't just buy the deck of your favorite pro-skater, you also had to consider if the shape of their pro-model was right for you. 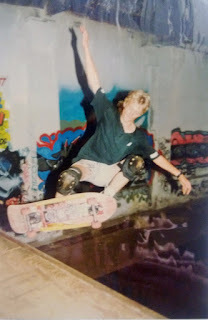 When I started skating (1988), skateboards didn't have any nose kick. When nose kicks started to become a thing, it felt like I was going to trip over the front of my deck. Now, riding anything without a full, tail-sized nose kick is a very odd experience indeed. Whilst I wouldn't call myself a collector, it's not uncommon for skateboard collectors to have a 'Grail deck'. A skateboard that's no longer in production, and generally very hard to find, from the 80's and 90's they'd like to own for whatever reason. Maybe it was there favorite board, maybe it's part of a set of team rider boards etc. As I said at the start, my grail deck is a red, wood stain, Jim Thiebaud, Santa Monica Airlines, Sanity, Giraffe deck from 1990. If you click the link you'll see that not too many red stain ones show up in a Google search. In fact, for years, this was the only image I could find (see image right). It's not that this design is rare, but finding a red stain one is (the green stain one seems easiest to come by). So how did this deck become my grail deck? The short answer is, there are many photos of me in my hey day of skating. Our skate crew had the benefit of my sister's growing interest in photography and willingness to point the camera at us. In the best photos of me, where I'm doing something at least half way impressive, the red, Thiebaud is the deck I'm riding. I remember buying my original Jim Thiebaud, Sanity, Giraffe Deck from the Edge Skate Park shop. The Edge, a large indoor skate park, was like our second home on the weekends by 1990, so I bought a lot of my decks there. Prior to this deck I had owned an SMA Natas Panther Deck. To be honest I'm not sure exactly which one, as I know I owned at least two in succession. A wood stain one, and a red one, possibly like the one on the right. 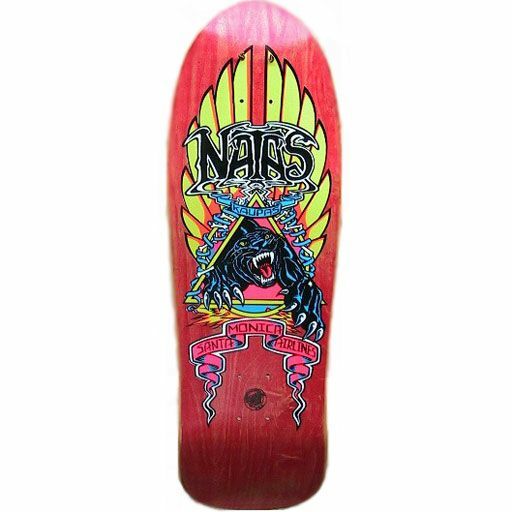 I was looking to buy another Natas deck but the Edge didn't have any in stock. At the time, I'd never really heard of Jim Thiebaud, except for his brief part in Powell Peralta's Public Domain Video that we watched many times over in the late 80's. I must have been determined to buy a board that day. Taking a closer look at the Jim Thiebaud, Sanity, Giraffe deck, I decided it was pretty much the same shape as my Natas, with the Missile II Concave, and bought that instead. Metal Mini, The Edge 1990-ish? I suspect this was the last deck I bought between when the Edge Skatepark closed down and we finally tore down my back yard mini ramp, as these two locations are where the best photos of me and the JT deck were taken. Back in the day, by the time I replaced my decks with a new model, the old one was usually pretty thrashed. Proper worn out with full on chips out of the top, tail worn down etc. They usually weren't worth saving, so I have none of my original decks from back then. The oldest deck I have, that I actually skated, is the equivalent of a Walmart or Target deck, which I bought around 1999 to try and get back into/remain in skating (I've been trying to get my skills back for at least 17 years!). That deck is a good example of how thrashed my skateboards used to get. Jim Thiebaud, Sanity Giraffe, decks are so hard to come by now. He wasn't with SMA for very long and wasn't as high profile as his contemporaries (despite being one of Tommy Guerrero's oldest skating buddies). I suspect, people who bought his pro-model decks back in the day skated them rather than held onto them. As well, ever since co-founding Real Skateboards, with Tommy, back in 1991, he seems more of a behind the scenes guy. I also think Jim became more known for his deck graphics than his skating due to his earlier Joker, pro-model deck being pulled from production after receiving a cease and desist order for copyright infringement with DC Comics. Then there's his more politically charged graphics at Real where Jim's Hanging Klansman deck is also highly sought after and extremely rare. Both decks infinitely more collectible than the SMA, Sanity deck. One thing about the Sanity, Giraffe deck is that no one seems to know who did the graphic. It's generally thought that maybe Natas designed it but why no one seems to have ever asked him is beyond me? He isn't dead... neither is Thiebaud for that matter. Somebody ask one of them! I've been looking out for someone selling Jim's Sanity, Giraffe deck online for years. Finally it happened. 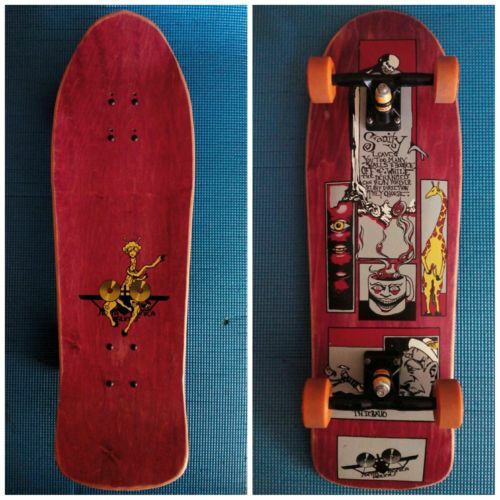 A collector in Spain put an OG one on ebay for EUR 400.00 (AU$560.00) complete with Variflex trucks and wheels. The board wasn't in mint condition. Someone had clearly skated it briefly, resulting in a bit of a scratched tail edge and at least one wheel bite mark. Neither a big issue for me. My main concern was price. For me, it's a lot of money to spend on a nostalgia, display piece. More than six times the cost of a modern Popsicle deck. I messaged my Brother, who knows a bit more about skateboard collecting than me, for his thoughts on whether the price was too much. I explained, the last time I saw this specific deck sold was in 2009, still shrink wrapped as NOS and nearly half the price. He seemed to think it was some-what expensive but the real issue was how often this specific deck comes up for sale. I was thinking the same thing, I just didn't want to pay far more than what the board is worth. In the end I decided the deck wasn't going to get any easier to find the longer I waited. Plus, at the moment, I'm way more back into my skating than I ever have been in years. Why not buy the deck and enjoy owning it while skateboarding is at the forefront of my mind. So I placed a bid. Fortunately no one else seems to be looking for this particular deck, or they just weren't prepared to spend so much for one. I'm now the proud owner of my Grail deck. I posted the new set up to my Instagram. The Variflex wheels that came with it looked like they'd seen better days and had the cheap (and totally shot) bearings they used to put in toy skate boards back in the 80's. I swapped them out for proper skateboard bearings (still shot, since this isn't a deck for riding, but cleaned up look presentable) and put on my mini-logo wheels that I originally bought for my Cage Monster deck but decided they were too large - making them perfect for a 1990's rig. I kept the Variflex Trucks because they looked new-ish and, to the untrained eye, have a very similar profile to the black, Gullwing Pro III trucks I used to skate - though not on my Thiebaud deck, which had heavy Aussie, Bonzer Trucks. 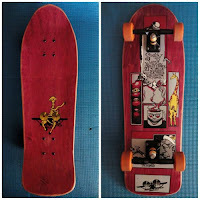 As I mentioned, some red, 1990's Powell-Peralta T-Bone wheels would make this deck complete for me. Those are equally hard to come by. I've seen NOS sets in people's collections but they rarely come up for sale. I'd be happy with re-issues but sadly, that's yet to happen.